The role of LNG imports into Europe is changing as the result of an oversupplied global gas market. Higher imports should result in a much more direct relationship between European hub prices and the flow and pricing of LNG cargoes. The role of LNG imports into Europe is changing as the result of an oversupplied global gas market. Higher LNG flows into Europe are set to erode the dominance of oil-indexed contracts in driving marginal hub pricing dynamics. This should result in a much more direct relationship between European hub prices and the flow and pricing of LNG cargoes. The much anticipated rise in surplus LNG flowing into Europe has proven somewhat slow to materialise in 2016. This is partly due to setbacks with large new liquefaction projects (e.g. Gorgon, Sabine Pass), as well as a delayed return of Angolan LNG production. There is also a post commissioning ramp up time for new export terminals to reach full production capacity, which can typically take 6 to 9 months. Chart 1 shows how LNG import volumes have started to rise in Q1 2016, but the impact so far has been small relative to the potential ramp up over the next three years. Stepping forward to 2019, there is little doubt as to the scale of new liquefaction capacity coming to market. The global gas market will need to absorb 150+ bcma of new LNG supply from projects currently being commissioned or under construction. Around 80 bcma of this will come in the form of highly flexible US export volumes. In an oversupplied global market, liquid European hubs will be the natural home for this gas. So how will LNG imports impact European hub pricing dynamics? We consider the impact of rising LNG import flows by looking at a view of supply & demand in the European gas market in 2016 and comparing it to 2019. In Chart 1 we show a stylised view of supply & demand at an annual level in 2016. The supply curve is developed by grouping categories of flexible gas supply as we set out in April. The demand curve shape reflects the gas vs coal switching volume analysis we set out May. 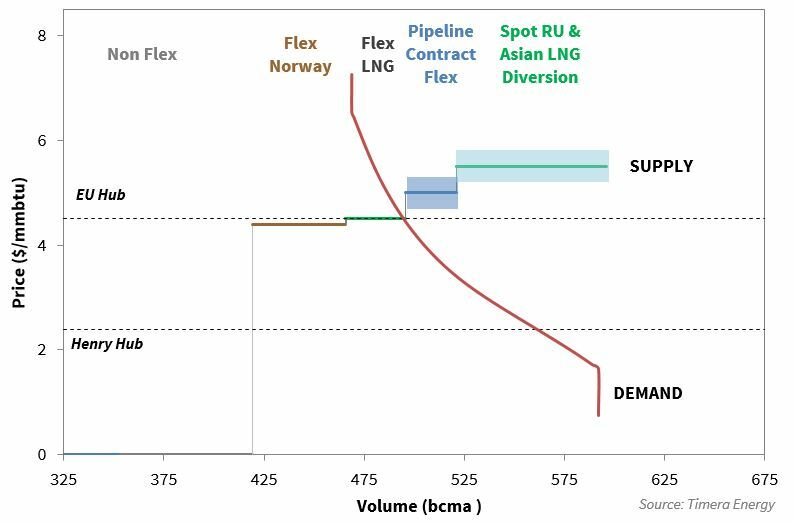 The most important characteristic of the 2016 supply and demand balance is that as surplus LNG pushes into Europe, it is displacing flexible pipeline contract volumes above ‘take or pay’ levels. This means that rising LNG import volumes are eroding the influence of oil-indexed pipeline swing contracts on hub pricing. The power sector is the frontline mechanism that enables Europe to absorb rising volumes of surplus LNG. This means European hub prices are increasingly being influenced by gas to coal switching in the power sector. Stepping forward to the end of the decade means making a number of assumptions on market evolution. For example, the volume of Asian and European gas demand and the level of oil and US gas hub prices will all have an important influence on the European gas market balance. Gas vs coal switching within Europe is relatively price insensitive and Asian demand response volumes are likely to be limited in the shorter term. This means it is the shut in of US exports that may need to do the heavy lifting to clear the temporary global surplus of LNG towards the end of this decade. This is illustrated in Chart 2 where US exports are setting hub prices in Europe (at an annual level). Under a scenario of US shut ins, European hubs would fully converge with US Henry Hub and the global LNG price support role would transition from Europe to the US. In our view this could mean a trans-Atlantic gas price spread of less than 1 $/mmbtu as we set out previously. Under these conditions, US export volumes are likely to be very sensitive to changes in the trans-Atlantic price spread e.g. a move in the spread of 0.5-1.0 $/mmbtu may be the difference between US exports flowing at full capacity and US exports being completely shut in. Russian oil-indexed pipeline contracts have been the predominant driver of European hub prices since market liberalisation. The transmission mechanism for the influence of Russian gas has been flexible oil-indexed swing volumes above take or pay. But these swing volumes play a limited role in the world of surplus LNG depicted in Chart 2. While these conditions prevail, Russia’s traditional influence on European gas pricing diminishes. Until the surplus of global LNG is eroded, LNG imports are likely to become the dominant drive of European hub prices. This would also mean a strong influence of Henry Hub given the importance of flexible US export volumes. The evolution of global spot LNG prices will directly impact gas flows and prices at European hubs. But there is likely to be an asymmetry in price impact. Henry Hub will provide strong downside price support. But there may be periods of temporary upside divergence in regional LNG spot prices which impact European hubs e.g. if there is a temporary shortage of LNG in Asia or South America. Pipeline swing is fast and flexible in its response to hub price evolution. LNG cargoes on the other hand are large, and often have significant supply chain lead times (e.g. over two weeks) to respond to market prices, given factors such as shipping times and access to berthing slots. Terminal storage provides some flexibility but this does not fully compensate for the chunky nature of flows. For example the arrival of 5 cargoes into NW Europe in warm week may depress prompt prices, whereas a gap in cargo arrivals during a high demand period may cause a temporary price jump. With Russian swing volumes relegated to the backseat, power sector gas vs coal switching becomes an important source of flexibility interacting with LNG import volumes. But the power sector is relatively unresponsive to price changes i.e. larger gas price swings are required to induce substantial changes in gas demand (this is illustrated via the inelasticity or slope of the demand curve in Chart 2). The interaction between LNG imports and the power sector will be an important factor to watch, with storage acting to smooth price dynamics on a within year basis. 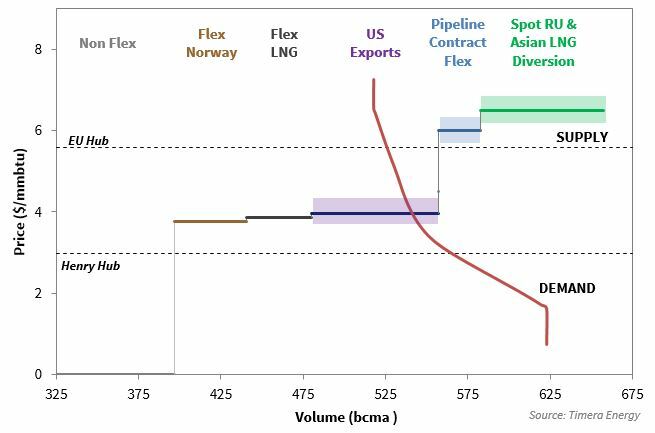 The prevailing view is that an overhang of flexible LNG supply should act to dampen price volatility. This is a compelling argument at a headline level. It seems logical that an oversupply of flexible and price responsive LNG, should act to dampen price swings. But we are not sure the outcome will be as simple as this, particularly given gas price volatility is currently at historically low levels. 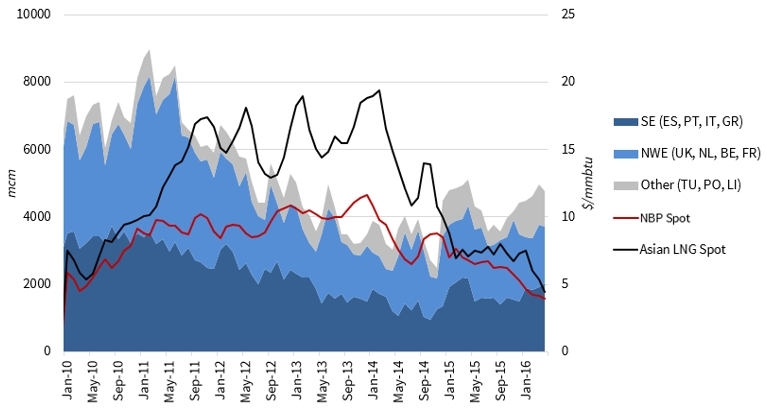 The ebbs and flows of European LNG imports may support periods of more pronounced prompt gas price volatility given the factors set out above. This is likely to combine with higher CCGT load factors providing a transmission mechanism for renewable intermittency through to gas price volatility. In our view it is a mistake to assume oversupply and lower gas prices equate to lower volatility.